Neil Peart likens music-making to working with stone, paper and scissors. The stone stands for the playing. The stone is then wrapped in paper, which represents the song. Scissors cut the paper, forming the arrangement, and completing the metaphor. How does Rush approach this basic recycling process? "We like pushing the outside of the envelope," the drummer-lyricist says. Indeed, in the 16 years since Rush first emerged from the Toronto bar circuit, the Canadian power trio has wielded more scissors than Peart has drums in his fortress-styled double kit. Some people still think of Rush as a metal band, an image grounded in the group's mid-'70s tenure as a skewed offspring of Led Zeppelin propelled by singer Geddy Lee's then-screechy howl. Yet the late '70s found the trio indulging in eclectic, textural excursions that recalled the English art-rock movement. Reggae flirtations a la the Police filtered in during the early '80s, before Rush delved into a more synthesizer-groomed sound. Today, "Presto," the band's latest album, sees guitarist Alex Lifeson's squealing licks and power chords returning to a primary role. "We've kind of made that highway for ourselves," Peart says about his group's anomalous position in the arena rock world. "Essentially I see us as a polyglot of all those things." "We've been fortunate that rock has changed so much in the last 15 years, that it has allowed us to have fresh influences all the time," Peart says, on the phone from an Atlanta tour stop, on the way to shows in the Centrum tonight and tomorrow. "All that stuff was interesting to us, just as music fans, and consequently tended to creep into the music," he says. "I had always been interested in reggae -- long before white people made it homogeneous -- and the same with African music. Long before 'world music,' I was very intrigued by African music, especially West African modern pop. So, to me, it was already a part of my influences. When it became a part of pop music in general, it somehow became easier to incorporate." Known for taking adventurous vacations -- he once climbed Mount Kilimanjaro -- Peart went to West African during a six-month break before Rush made "Presto." "I was bicycling around Togo and Ghana, and the Ivory Coast, and I got to sit in with a troupe of Togolese drummers." Not that "Presto" is at all like a "Graceland" for Rush. But then, the serious-on-the-surface band has its subtle in-jokes, even in a steamlined riff-rocker like "Superconductor." "One of the musical puns in the middle, in the instrumental section, is actually a West African pop beat I heard constantly while I was there," Peart says. "That part was mapped out as a string solo, and Geddy worked out an almost ska bass pattern over it. It was a marriage of such disparate elements, but one of the things we have learned over the years is how to do that. We used to try to do it, and it would come across like three pieces stuck together and we didn't know how to glue it yet." Helping Rush with the scissors and glue for "Presto" was Rupert Hine, a keyboardist-producer known for his slick work with the Fixx and Tina Turner. Hine would seem to be an odd choice as co-producer for an album marking a slant back to guitar and, for Lee, priority to bass over keyboards. However, Peart says, "While the shift in focus was there, there are still no fewer keyboards in there... Rupert was tired of working with machines, and with nothing but keyboards and sequencers. So he was ready for a more organic approach." An organic approach isn't what one would normally expect from chronic perfectionists like Rush -- who took more than six weeks to rehearse their musical assignments for the current tour. 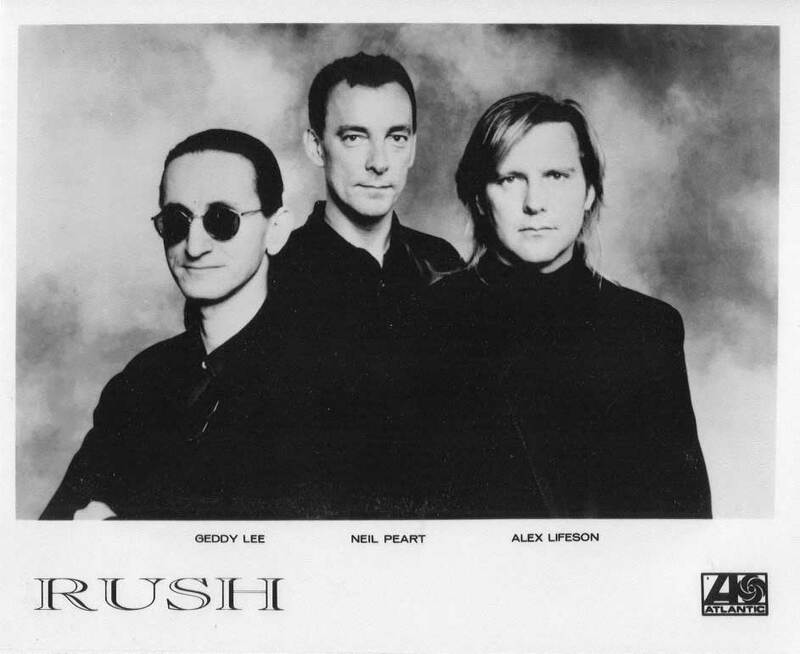 As in the past, Rush weighed the idea of adding a keyboardist or even a singer, as Lee recorded more backing choruses on the new album. But they decided to remain three-piece, filling out the sound via pedals, synthesizer patches and electronic drums. "Just the integrity of the three of us is something we don't want to mess with," Peart says, "and there's also a certain pride in being a trio and seeing how much we can do with three sets of hands and feet on stage. "We've never agreed with the idea of using tapes, but there's so much available now in digital sampling and sequencing that we can control and trigger ourselves like we're actually playing them. The pressure is on us to actually hit these things at the right time, so it never feels like the easy way out." New musical tools, nonetheless, did present an easy way out for one Rush tradition that feel by the wayside during the early '80s: the dual double-neck guitars Lifeson and Lee once wielded (to striking visual effect) on the 1977 fantasy song "Xanadu." "It was just a necessary thing because they were so damn heavy," Peart says. "That's a song, for instance, we have resurrected, but with technology, it's no longer necessary -- fortunately -- for them to carry those thousand-pound guitars!" What does Peart now think of mid-'70s albums like "2112," "A Farewell to Kings" and "Hemispheres," with their mythological/sci-fi lyrics and loft arrangements? "When I look back at that stuff now, I see the flaws very apparently, the disjointedness of a lot of it, because we hadn't learned a lot about arranging then," he says. "If your mother drags out your Grade 2 crayon drawings, you're obviously not going to look at them as the pinnacle of your life." Nowadays, Rush crafts tighter, punchier tunes like the current hit "Show Don't Tell," and Peart's lyrics reflect more personal and pressing philosophical issues. Among other new songs, "The Pass" and "War Paint" explore the folly of vanity, while "Red tide" addresses the issue of ecology with such lyrics as "Now's the time to turn the tide, now's the time to fight." "Even going back to the 'Grace Under Pressure' album, as soon as I started cleaning off the windows and looking at the world around me, it was something that demanded to be written about, because it outraged me," he says, wryly adding, "Now, with Earth Day, I guess I don't have to do that anymore!"